I think this part of the question is a red herring, at least in light of my own experience with Tinderbox. Yes, Tinderbox provides a set of features that other software doesn’t necessarily include. But are there things you can do with Tinderbox that you can’t do with other software (either on its own, or in combination?). Not really. It’s more about the way Tinderbox supports me in accomplishing what I want. and a bunch of other stuff. All things that I can do (and have done!) using other software. Tinderbox provides many features that allow me to do something pretty similar. It’s not an exact mirror – I’m not trying to replicate my paper notes in software – but it does provide tools to support the general idea of “here’s some stuff I care about” (notes) and “here’s some stuff to help me understand why I care about it” (organization & annotation). At a more advanced level, I see Tinderbox as a not-too-clever – but very quick and thorough – assistant. I say it’s not-too-clever because it doesn’t understand meaning. I can’t dump a bunch of text into it, and then tell it “find me all the notes related to Project X.” But if I’ve previously identified notes as belonging to Project X, and I know from my experience that Project X is similar to project Y, I can tell Tinderbox “find me all notes related to Projects X and Y”, which in my specific context have value to me as I consider Project X. Essentially, if I can specify criteria for finding notes, or I can specify actions to take on notes, I can have Tinderbox do that on my behalf. But figuring out those criteria, or the actions to take? That’s on me. what would be the relevant difference between ‘way’ and ‘can’? ppl generally dont like hard questions, and this is a hard question. and even for more educated ppl in society, this difficulty also affects them as well in the way of reactions & replies. this kind of question requires other ppl to have experience with other tools, and thus able to make an accurate comparison. this is the general case. Find all items tagged with "Project X"
then I decide that “Project Y” is related, so I create a “Project Y” tag, tag the relevant group / documents with it, and add an OR condition to the smart group. So far I’ve done basically the same thing, expressed a little differently. The results that DEVONthink returns will be in a big list. It has a few views – it can show me the group hierarchy, or the tags, and that’s about it. If I want to search within the list of returned results, I can, to an extent. I can either use the search bar, or edit / duplicate the smart group. I can’t, however, make a new smart group that references the results of the previous smart group. So that’s one place where Tinderbox comes in handy. First of all, the agents are much more sophisticated than DT’s smart groups. On top of that, I can create a new agent that references the results from another agent. I can progressively filter notes, on any axes that I choose. Now that I’ve got a list of documents that are interesting to me, it’s time to start working with them. I can pull up some mind mapping software and start plotting the names, and paste RTF links to get back to the records in DT. I can use an outliner to start presenting these ideas in a more structured way. And when I want to link between documents – even if one is a movie and one is a PDF – I can create a text document and paste the x-devonthink-item:// URLs into there. 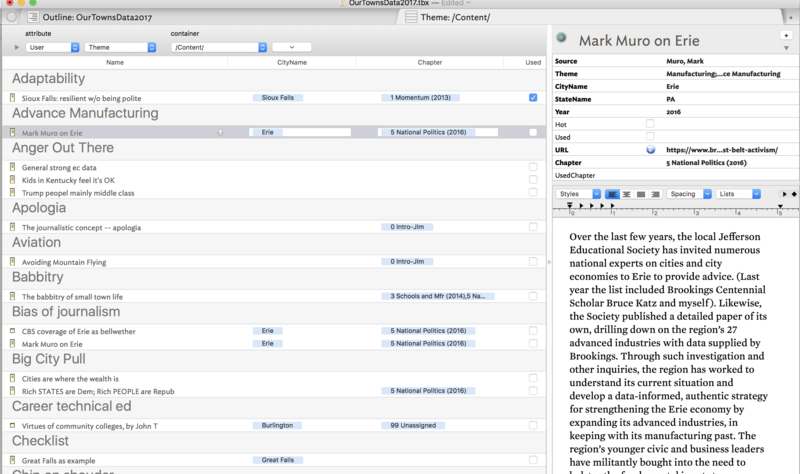 I can even store my mind map and outline files in the database itself. So for the most part, I can use other applications to accomplish a lot of what I do with Tinderbox. But, it feels hodgepodge to me. DEVONthink holds my email from the last 8 years, all my financial records, various “things” I’ve collected over the years… it just doesn’t feel focused. With Tinderbox, I can have a single document where I do most of my thinking. The mind-mapping(-ish) and outlining tools are built in, and it has native support for links between notes. The things I want to do, I can do faster and more effectively using Tinderbox. To me, that’s all a description of “the way” Tinderbox supports my work and how it’s different from other applications. To you, that all may simply be “what Tinderbox can do that other applications can’t.” That’s fine – we just come at it from different perspectives. I think the challenge here is that Tinderbox is just so open-ended. If you figure there’s a spectrum between “What can I do with a computer?” and “What can I do with Highly Specific Software?”, I think Tinderbox is closer to the computer end of the spectrum. What can you do with a computer? Well, a lot really. What would you like to do? Tinderbox is kinda like that. I hope that helps a bit. I think that’s as much as I’ll be able to contribute here.